Twenty-six years later it hosted the funeral of Charles de Gaulle, a rare honor for the leader who steered France's resistance during the war. 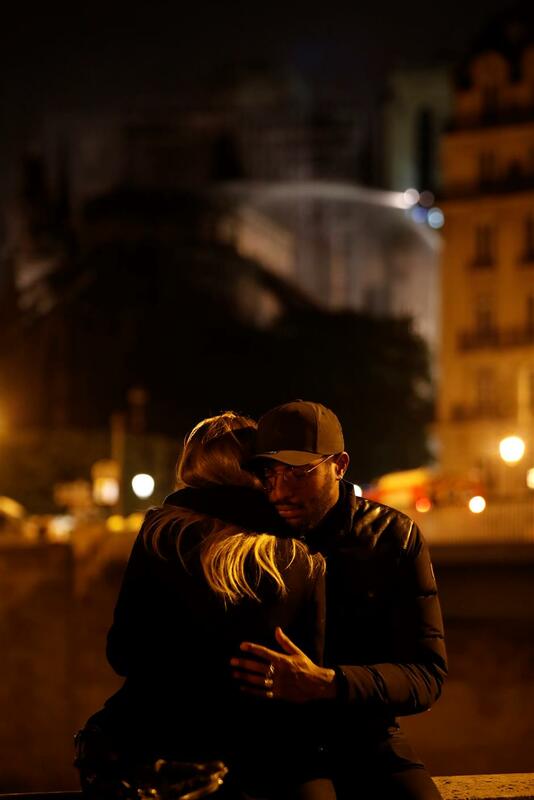 A couple hugs as firefighters fight a blaze at Notre-Dame Cathedral in Paris early on April 16, 2019. In 1831, Hugo brought the cathedral alive with "Notre-Dame de Paris," giving it a personality on par with the novel's heroes, the hunchback Quasimodo and the gypsy beauty Esmeralda. It was this spire which collapsed to gasps of disbelief from horrified onlookers shortly before 8:00pm on Monday, consumed by the flames ravaging the roof and the wooden latice supporting it, known as the "forest."